hightouchmegastore: The same old thing at the same old place. Tonight, I was a part of a reading for the rolling launch of Fire in the Pasture: 21st Century Mormon Poets. (Yeah!) It was really fun--a dozen poets, almost none of whom I knew either by face or by their work. The spirit was lively and convivial, a bunch of terrific poems, everyone seemed to enjoy him or herself immensely. This meant, of course, that at the end of it, the historian and I wanted to go get a celebratory bite to eat. The historian: Where do you want to go? Me: I don't know--where do you want to go? Me: (happy dance on the inside) YES. with ancillary and occasional other places. But mostly the above, and the reason we keep going to these places is that we have things we like to eat there, and when we are tired, worn out, cranky, knowing you can go to your one Mexican place and have a chile relleno or a shrimp enchilada, without really thinking about it very hard, is comforting. On the other hand, you can feel unimaginative when you're all, "We could go to Mexican Place 1...?" 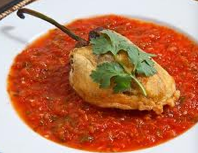 and you can see that your companion is going "chile relleno" and basically salivating, and you are doing the same, but thinking "shrimp enchilada." That's possibly just a little tragic. 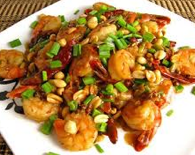 I remember awhile ago, when I was going through a Kung Pao Shrimp phase. Oh how I loved that dish. As a friend once said, the power-weight ratio of Kung Pao Shrimp is pretty impressive--it's the peanuts, which make even the non-shrimp part of KPS feel rawther hefty. I ate KPS at pretty much every possible Chinese restaurant there was for several years and thought I would never, ever tire of it. Is this a good thing or a bad thing? Is it, in effect, scientific research? To test variation in instances of KPS across geographical regions? Or is it just that one cannot come up with something more imaginative to eat? The historian: We could go to the one Indian restaurant. Or the one Mexican restaurant. The historian: ...or we could go to Bambara? Me: ...yes, we could--but why is Vinto so crowded? Let's drive past it again. And lo, in the five minutes it took us to get back there, it looked much less crowded. So we could have the usual margherita pizza (delicious!) and the familiar roasted artichoke hearts (fantastic!) and white bean salad (not the same old thing, because it was a special), and tiramisu: perfect. Sometimes the same old place, with its beloved pizza and artichokes, is the best. This post and the previous post lead me to believe that you are living the good life. You fools!!! Seetebello is so superior! And I always get in super quick. tsk tsk. I agree with Nik. This sounds like the awesome life. I agree with Sophia -- Settebellos is amazing! The verification word was "Slont," which I want to be a word in real life. I want your posts to be sent directly to my email because I am MIA in the blogosphere and then when I check back in here there are handfuls (as in more than one hand can get in one grab) of excellent sketches I have missed. Is that possible?